This dimmable high performance GU Base A-Lamp from TCP is part of the Elite series and offers light output in all directions to suit many applications. It is designed to fit any installation where a GU24 CFL is used. With a 800 lumen light output, it provides enough light to replace a 60 watt incandescent bulb. The 2700K color temperature produces a warm white glow. 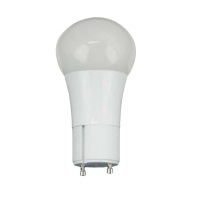 This 10 watt A19 bulb has a GU24 base and an average lifetime of 25,000 hours.